Deciding how to deal with hair loss is an intensely personal choice and one that has not been helped by a perceived ‘stigma’ attached to men who decide to investigate ways to keep their hair. 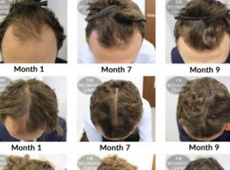 This type of negative attitude, denigrating men exploring hair loss solutions as ‘vain’ and ignoring the emotional and psychological effects losing your hair can have, has thankfully been hugely reduced in recent years, to the point where it has been considered men’s equivalent of a having a breast enlargement. This switch is largely due to the influence of a handful of celebrities being brave enough to share their battles with Male Pattern Baldness openly. In the UK, footballer Wayne Rooney is perhaps the most prominent man to go public with his decision to have a hair transplant to address his premature balding. The huge increase in enquiries into this type of surgery from across the UK following his first operation was dubbed ‘the Rooney effect’. Stan Lee’s ‘Lucky Man’ actor James Nesbitt has also made a similar impact after speaking candidly to the media about his two hair restoration surgeries, and is proud to have played a part in busting this taboo. In an interview with the Irish Independent the 53-year old, who decided to address his advanced hair loss for work-related reasons, explained why he felt it important to be so open about the experiences which have left him with such a good head of hair, it was once mistaken for a wig. “Some men it doesn’t bother, but there are men that it does and it’s a difficult stage to go through. I’m married to my own vanity and I just didn’t fancy going bald,” said Nesbitt. He is certainly correct in saying that many men do not want to talk about how they regrow thinning hair or deal with a receding hairline. 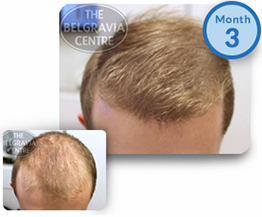 One of the reasons many Belgravia clients give for following a non-surgical hair loss treatment course is the discretion it offers, given results tend to occur gradually and therefore less likely to draw immediate attention. Actors, however, have options for hiding their hairloss that simply wouldn’t work in everyday life – for instance, having their hair digitally altered to look fuller on screen. Another way in which a ‘perfect hair’ myth can be maintained, along with wearing wigs, hairpieces, colouring in their scalps to match their hair colour or using microscopic hair fibres – which make the hair look temporarily thicker, although often somewhat matte – for photoshoots and public appearances. The Cold Feet star has had two separate hair transplants and also follows an on-going aftercare hair treatment regimen comprising the only MHRA licensed and FDA approved topical and oral hair loss medications. James Nesbitt says he does this “to improve the quality of my hair and to prevent further hair loss”. 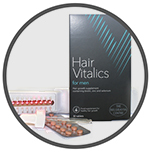 His approach to preventing baldness and encouraging hair growth is one approved and widely recommended by top hair specialists and surgeons both prior to and after a hair transplant, or for men whose hair follicles are still functioning and want to avoid surgery altogether.